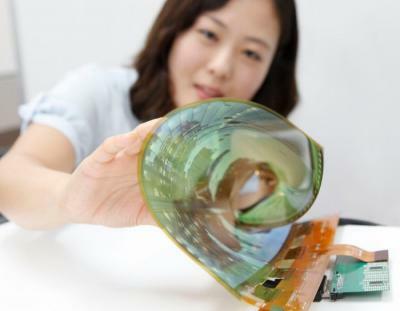 During an investor conference call, Universal Display revealed some new details on LG Display's flexible OLED program. According to UDC, LGD's current production capacity in its 4.5-Gen fab is 14,000 monthly substrates, more than double its capacity (6,000 substrates/month) that was reported in the middle of 2014. LGD indeed said they expect to double their capacity towards the end of 2014, and that's great news. Some of that capacity will go to LG's own flexible products (such as the G Flex 2 and the G Watch R) - and reportedly also to support Apple's Watch which will launch in April. We already knew that LGD adopted an LTPS backplane and RGB (direct-emission) architecture in their flexible OLEDs. But UDC revaled that currently LGD uses a red PHOLED with blue and green fluorescent materials. UDC believes that LG will adopt a green PHOLED in their unext-gen production setup - and this will enable them to cut display power consumption by around 25%. Ron, can you comment on my interpretation of Sid's comments on Samsung capacity? Basically, he highlighted Samsung's recent press release about OLED expansion over the next 3 years as a more than doubling of their capacity to produce smartphone and tablet size displays, and then said "in addition" they will be bringing on A3 in Q2 this year for flexibles/wearables. Is this correct? Cooters, it seems as if the new fab is supposed to be glass-based OLEDs, and so indeed he does not take the A3 into account in his calculations. I think that trying to estimate SDC's OLED capacity in 2017 is not wise at this stage. I agree it is best to look at the next phase of expansion and not several more beyond that, however, it is significant knowing the Samsung announcement on Wednesday was not just a re-iteration of A3 but a major new plan. I would add for Samsung to even plan this level of expansion indicates two things - A) they will remain active in the merchant OLED market, and B) they in theory will be using OLED for ALL their smartphone and tablet products in 2017 and beyond. Given the news from Samsung are they planning at some point in returning to developing OLED TV's? It seems it would be prudent on their part.